This is an ever growing glossary especially for drummers wanting to learn more about typical drum terms and drum lingo. Don’t see one? Let me know! 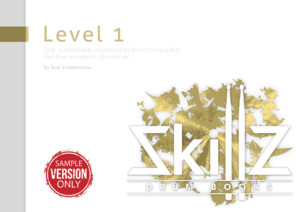 You can also use this in conjunction with Level 1 – The workbook/encyclopedia for the Modern Drummer. Playing patterns or rhythms with one limb at a time. Playing patterns or rhythms with two limbs at the same time. Playing patterns or rhythms with three limbs at the same time. Playing patterns or rhythms with four limbs at the same time. A section or subsection which is four bars long. 12-bar form in the style of Blues. Music originally from Cuba. Afro is added because of the African (rhythmical) influence on the Hispanic (melody and harmony) music. There are many, many styles and subgenres stemming from Afro-Cuban. Most of these revolve around the Clave, or more accurately, one of the Clave Rhythms. Another way to describe beats 2 and 4. As opposites of beats 1 and 3 they represent the back of the beat. Brazilian style of music revolving around a bass pattern playing 1..&3..& or 1..t2..t in 16th notes. The Bossa Nova tempo ranges roughly from 65 – 90 bpm. A song played by someone other than the original artist. Subgenre of Prog(ressive) Metal with a strong emphasis on Cross Rhythms and longer a-symmetrical phrases as played by Meshuggah f.i.. The name is a phonetic one (an onomatopoeia) as the sound of picking the muted lowest string of a distorted guitar could be described as “Djent”. Another way to name beat 1. Terminology specifically used in drumming and among drummers. Also called “drum lingo” or “drum slang”. Can be used to refer to a groove, or to musical sensitivity. The right feel: The musically correct way of playing. Style of music invented in the mid sixties by James Brown and his band with the legendary drummers Jabo Starks and Clyde Stubblefield. Style of music blending elements of jazz, rock and all sorts of latin music. Rhythm with feel. To be in the groove means playing a rhythm with the right musical feeling. (Shuffle) groove where the backbeat (usually played on the snare) is on beat 3 instead of 2 and 4. This way the tempo seems half as high, hence the term. The two cymbals which can be opened and closed with the foot by pressing the hi hat pedal. The hi hat can also be played with the foot to get a short, staccato chick sound. This is called a “stepped hi hat”. The hi hat can also be played by the foot in a way that it produces a long note. This is called “flanging the hi hat” or “splashing the hi hat”. Newly formed rudiment comprised of two or more existing rudiments or elements of these rudiments. Type of coordination needed to execute patterns or rhythms consisting of two or more unique patterns or rhythms. The patterns or rhythms involved may be symmetrical or a-symmetrical. The latter would be Cross Rhythms or Polyrhythms depending on how they’re used. Layered coordination is also known as Harmonic Coordination. Long sound. The opposite of “staccato”. Type of coordination needed to execute one pattern or rhythm with more than one limb without notes being played by more than one limb. Usually the term is used when three or four limbs play the pattern or rhythm. Linear Coordination is also known as Melodic Coordination. Typical phrases or exprtessions used in a specific trade or profession. A.k.a. “slang”. So Drum Lingo is a collection of phrases used typically in druming and rhythm as common knowledge. Musical lingo for sentence, string of notes, or phrase. We as drummers usually play licks as a fill or in solos but they can be used as grooves as well. A recurring pattern. This can be played by one limb, 2 limbs or 3 limbs. The remaining limb(s) play(s) the melody. We therefore often encounter Ostinato/Melody exercises. Playing with a good time feel. Playing in the pocket means the groove is feeling exactly as it should. You own it. A subdivision of five notes per pulse, usually per quarter note. Check this if you want to learn more about quintuplets. Caribean Musical Style from Jamaica. Rhythmically there are two elements which can be considered a typical ostinato of a Reggae groove. 1. The hihat 8th note upbeats 2. The Bass Drum back beat on 2 and 4. The left hand typically plays rimclicks as a melody on top of the ostinato. A Rudiment is an elementary part. In (snare) drumming this means a basic ‘word’. Initially rudiments were seen as letters so it was probably no coincidence that there have long been twenty six official rudiments. In recent years the Percussive Arts Society (P.A.S.) certified another fourteen. So now the official amount of P.A.S certified rudiments for snare drumming comes to forty. Click here for a more complete overview of rudiments. Brazilian style of music revolving around a bass pattern playing 1..&3..& or 1..t2..t in 16th notes. The Samba tempo ranges roughly from 95 – 130 bpm. A subdivision of seven notes per pulse, usually per quarter note. The Single Stroke roll or simply called “singles” is a rudiment which consists of alternating strokes. Short sound. The opposite of “legato”. A song which is considered to be a classic. The musical implication is that everyone should know it. The number of notes in which a note is divided. Usually the number of notes per quarter note. Tempo. Playing time also means playing a standard groove to keep time. The way a groove feels or is felt. Literally keeping tempo. A more musical translation would be to keep the tempo feeling good. Two or more notes played at the same time. These are also called Flat Flams. Short for Auxiliary hi hat, sometimes also referred to as a remote hat. A closed hi hat used as a 2nd, 3rd, 4th etc. A snare considered to be one of the holy grails.